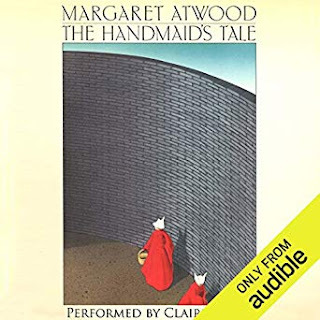 Because I Told You So: Book Report: "The Handmaid's Tale"
"The Handmaid's Tale" subtly mulls over the slippery slope of compromised freedoms and integrity that gives way to zealotry forcing society into totalitarianism. The absurd, barely fathomable hyper patriarchal dystopia of Margaret Atwood's 1985 novel stands as a warning of how important it is to protect civil liberties with ferocity at every turn. If you're familiar with the flashback and grim slice-of-life rotation of the series, you'll find welcome familiarity in the pattern of Atwood's storytelling. You're inside the head of state-supported prostitute Offred, who rebels against her plight with subtle words and actions that blossom into brazen disruption of the social fabric that constricts her. The show adds much more psychological and background detail. The advantage of the book is that it keeps you guessing and requires you to fill in the gaps with your own speculation. Claire Danes' narration of the Audible version is a revelation. She recites the story with a simmering rage that makes me imagine that her performance as Offred in the series might have surpassed the Emmy-winning turn by Elisabeth Moss. "The Handmaid's Tale" leaves you with a nauseous feeling, lacking much of the sense of empowerment of the Hulu series. The book sets you on a rough, bruising journey that rewards you by igniting discomfort and outrage in reaction to the gauntlet to which it subjects Offred. It's a chilling slice of horror that may be too much for some to handle.